Old Europe Cheese, Inc., certifies that all cheese hand-crafted at our plant in Benton Harbor – Michigan are produced with microbial rennet, enzymes and cultures that are allergen and GMO free as well as Kosher certified. It is also suitable for “Vegetarian” cheese types. 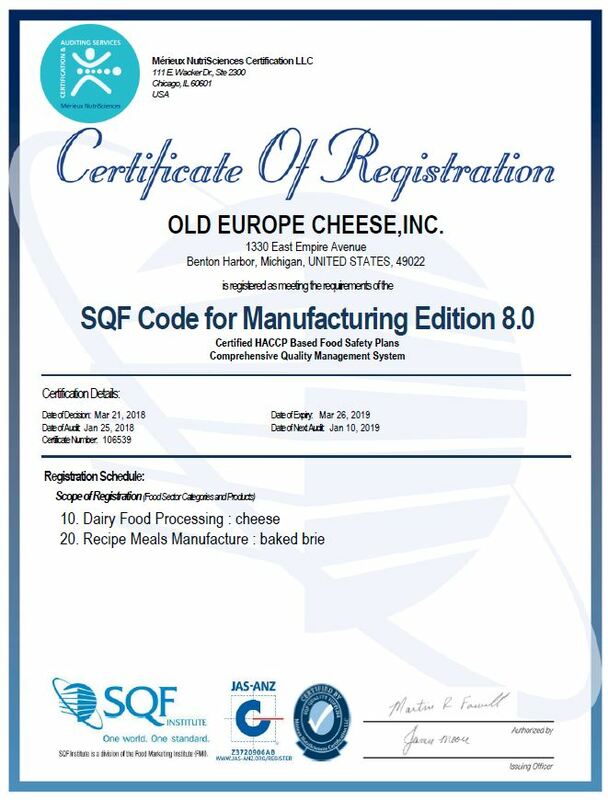 — Francois Capt, General Manager – Old Europe Cheese, Inc.
Old Europe Cheese, Inc., certifies that all cheese hand-crafted at our plant in Benton Harbor, Michigan are wrapped in packaging that does NOT contain Bisphenol A (BPA). Old Europe Cheese, Inc., certifies that all cheese hand-crafted at our plant in Benton Harbor, Michigan, USA are produced without added GMO(s). Old Europe Cheese only uses wholesome Michigan Milk Producers milk and cream. All of Old Europe Cheese products are made in the United States of America. Michigan Milk Producers Association certifies that all the milk produced by our members farms has been certified rBST free. All milk reloading from our facilities located in Ovid and Constantine Michigan is also certified rBST free. All milk and cream purchased from MMPA is produced by dairy cattle that have not been genetically modified. Effective January 1, 2016 all farms that have a marketing contract with MMPA are enrolled in the National Dairy Farmers Assuring Responsible Management (F.A.R.M.) Program. Details of the F.A.R.M. program may be accessed through the http://nationaldairyfarm.com/animal-care#standards website.